The basic structure of this chair draws Inspiration from the design of the iconic ‘Conoid Chair’ by the great japanese-american woodworker George Nakashima. 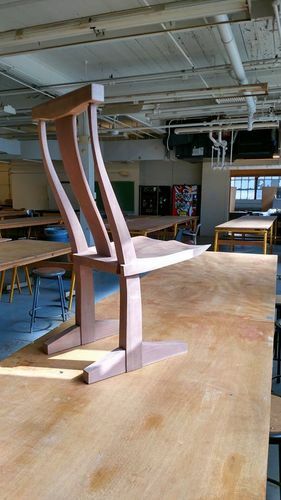 Through progressive scaled models, design critique and study of human ergonomics the design of this chair is evolved from the basic concept of the nakashima chair. Made entirely in one slab of 4” thick walnut (type of a hardwood), I have also tried to stay true to nakashima’s philosophy of creating minimum waste. Structurally, the focal point of the overall design is at the base where the uprights emerge from the feet and gracefully taper as they reach the top. The connection between the upright and the foot is achieved by a ‘bridle joint’ where the rectangular slot (mortice) in the center third of the base of the leg is housed by a tenon of same width cut into the foot. The main challenge in the overall design is to balance the weight of the seat entirely on two uprights instead of four or three legs as designed traditionally. Nakashima’s brilliant solution to this is another ‘bridle joint’ between the seat and the uprights. This time, the legs are cut to create a tenon of the third width which is housed inside the mortise of the chair. At the same time, a maloof style joint is developed which provides immediate base support for the seat. This sliding joint needs to be precisely cut to avoid failure. It is also important to keep the weight of the seat as light as possible to reduce the dead load on the joint. This is achieved by carving the slab which also acts as a comfortable seating surface shaped to house the buttocks of the user. The slab also tapers from the back to the front providing required thickness for joint support and minimum thickness to reduce the dead weight. The carving of the seat is achieved by hand tools such as spoke-shave, draw-knife and scorps to name a few. For this project the seat is carved by hand using both power tools and hand tools. The seat is made by jointing of two slabs 3” thick using domino joints. After rough cutting and planing the slab to thickness (2” – 1/2”), desired shape is drawn on the slab. With the use of a drill, holes are punctured to the desired depth for reference. This process is extremely important. 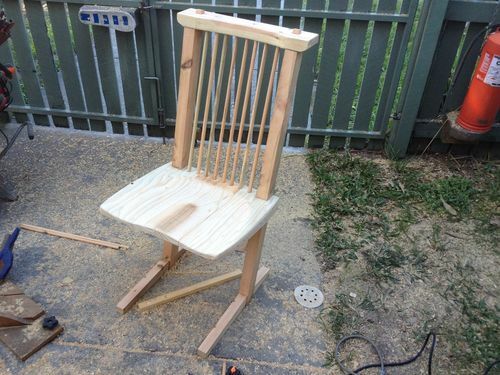 After this, a hand sander is used to carve out major chunks of wood to roughly shape the seat. After this, with the use of spoke shaves the seating surface is evened out. This leads to the sanding of the surface using a handheld machine sander. The sanding starts with the lowest grit 60 and a seating surface typically gets sanded to 400 grit. This makes the seating surface extremely smooth. 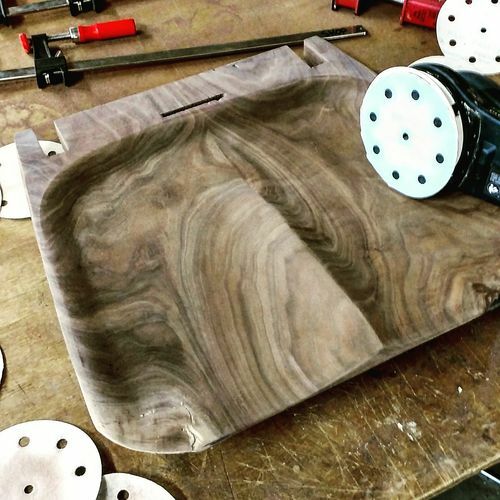 The sander is similarly used to finish every part of the furniture. 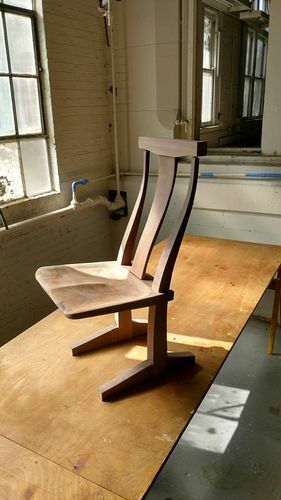 The back rest developed for this chair was to provide lower back support to the user while sitting in the chair as compared to the straight spindles of the original conoid chair. It was observed that due to the structural design of the furniture, the user’s tendency to sit back into the chair would call for an immediate rest spot as sitting on the front edge would result in toppling/ failure of the chair. To accommodate this need, the backrest and the uprights were sculpted into a beautiful curve which is topped with a relatively higher neck support. With two uprights, two feet, a backrest, a headrest and the seat, this chair was dry-fitted for refinement by sliding one joint into the other. Upon the dry fit assembly, i came across an absurd problem which seemed huge! The legs were getting twisted because the heights at which the slots were made into the legs were not aligned. This resulted in lifting of one of the feet from the front by about 3/4”. After much discussion, it was decided that I would level the slots on the same components. Thankfully, 24 hours later the problem was mitigated. This being my first ever attempt at making a real scale furniture out of hardwood, I must say this was an exceptional experience for me. Though I would say this was a difficult project for a first timer. I’m surprised that it even stands, and had been tested to be sturdy and has a loading capacity of around 250lbs. I’d like to thank all those who helped me accomplish this great project. My professor, Carl Lewis was the visionary who lead me in this direction and motivated me to take a giant step in redesigning this masterpiece by George Nakashima.The University of Illinois woodshop and fabrication Lab Manager Lowell Miller is the most resourceful and caring person I have met who helped me at every stage of this project, from design to completion. Every student worker at the woodshop had constantly supported my venture and have been very helpful. I’d not have been able to make this project into reality if it was not for all these wonderful people. To all of you, I owe my success. Currently the chair is wrapped in bubble wrap ready to be shipped to my next home. The chair is glue fit (wood to wood joints glued together for stability, no screws/nails) and sanded and ready to be polished. Wood working has proved to be therapeutic to me. I hope this chair lasts for generations. Leo the chair looks very interesting with some nice lines. The walnut looks super too. You should post it as a completed project when you can get more pics of it. You’ll get a lot more input and responses from the community. The two feet make the chair unique no matter what design mods are incoporated its a GN design concept. I made one earlier in the year but never finished it.